I have been working on a new project this week and finished it today. 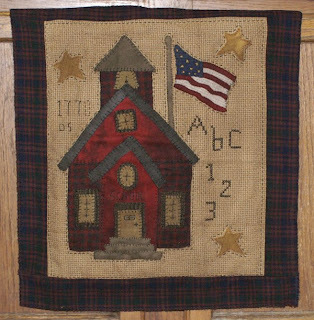 I made the school house wall hanging for a friend and wanted to do something like that in a punched piece. I decided I wanted to put it on a chalkboard and with the extra space, I thought a mini stitchery would go perfect with it. Both pieces I made up as I went. 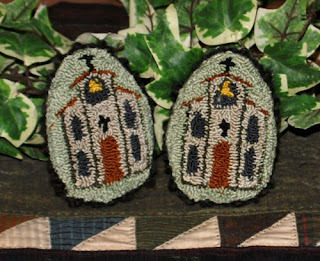 The stitchery is was designed as I went, adding one thing and another. I was thinking I was a 7 year old school girl without the experience of the older girls and just went with it and as you can see, this is the result. I put the name Edith, my grandmother's name. She is the one who rug hooked, sewed, and had a ceramic studio, so you can see who I got my creative genes from. I painted and antiqued the chalkboard. The entire set has that old yellowed look to it. I love how this piece came out and this will be hard to part with. But, it is going up on ebay later tonight if anyone is interested in this piece. I was experimenting this week and trying some new designs. The first is a rabbit pillow. I love how this one came out and the stain I used. 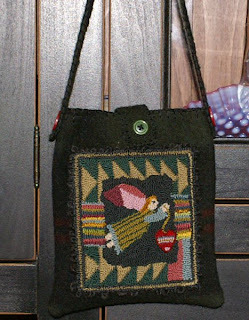 This is what is called java stain, it is a greenish black antiquing medium. I am thinking I might put this piece up for sale. This is what the back looks like. I used ticking and floss to stitch my initials and the date. I am always open to offers, so if anyone is interested in this piece, they can make an offer before I put it up tomorrow. Then I decided to make matching eggs, not sure about these. One is a bit off, so will think about it. Of course the eggs made me want to try more in a different design, so I made up some smaller ones. So, what do you think? Would you buy any of these items? What ones are your favorites? What kind of designs would you like to see on eggs? This is a piece I made for a friend. She had bought an old school desk and wanted something to go with it. 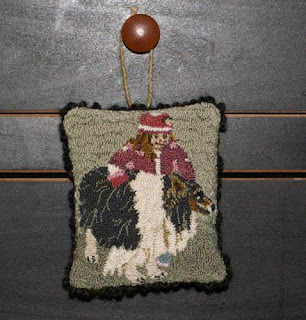 Of course that made me think of a schoolhouse and I was lucky enough to have a friend who had a great pattern, and she sent it to me. 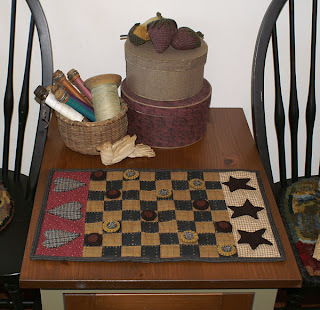 The pattern "Liberty" is from Fig Tree Quilts. 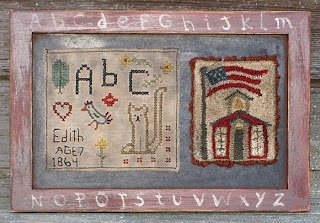 I had to change it, as usual;) I appliqued it onto prairie cloth and added the letters and alphabet. I have to admit, it was hard working on the cloth, not as much surface area to sew into. 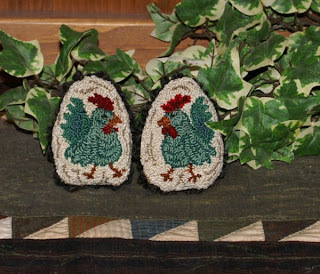 I used wools and a blanket stitch on the larger pieces and a whip stitch on the smaller ones. The borders are done with wools from my stash of "as is" wools, as is the backing. Tonight I was busy working on my newest punch pieces. The new ones will be going on ebay. I am a glutton for punishment, and thought I would try some sales again. I have so many projects and things I want to make, I feel like I will never be able to catch up or do them all. The first punch I made for my friend Cyndi. She sent me punch needles from other designers as "Happy Presents". What are Happy Presents? Well, I call them that since I was little. Whenever we were really sick, my mom would buy us a happy present to make us feel better. Now we call them Raks; Random Acts of Kindness. Just a little something we send our friends to brighten up their day. So, Cyndi sent me this punch and I thought it would make a great give back present for Valentines. 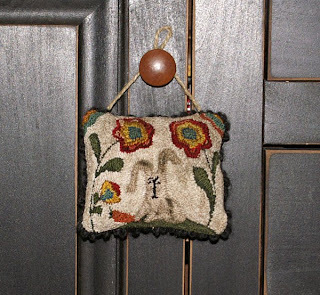 I put the punch on a piece of wool and then thought, that it would make a cute little pouch, so that is what I made. It is all wool and I did a blanket stitch on the handle. I added a bag of lavender inside, her favorite scent. This punch I made myself. I used a photo from Jacque's blog for the design. 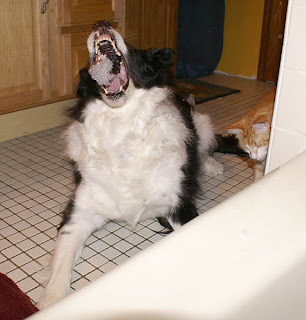 It is a picture of her granddaughter Kaylynn and one of her collies,Tango. I did it in 3 strands for some of the smaller areas, but most of it is done in 6 strands of floss. I really would like to do more punches with photos, but use more detail. This picture was so fun to do, I really enjoyed making it. 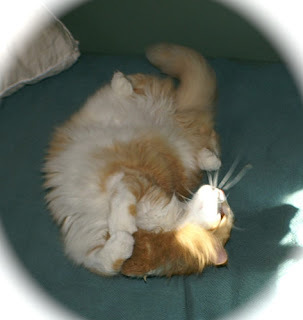 Dora prays that everyone has a Valentine filled with love and happiness. I finally finished my Cats in the Garden. 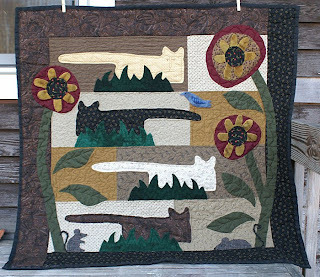 The original quilt is called "Six cats in the garden," by Linda Brannock. As you can see, I have four. Each one is done to represent my furry babies that have passed on and the top one is Dora. I use the brown paisley to represent my Tortie, then my big white guy and black for my beloved Black. I used a darker thread on Dora so that her face shows more than the others. 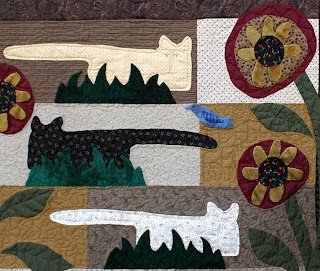 I think this quilt pattern makes a great piece to memorialize your kitties. 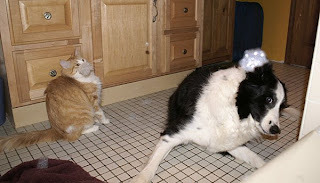 I added a few of my own items, that kitties love to chase. I also added grass, because I placed my kitties in the wrong place, so that was an idea for a good fix it;) The quilt is hand appliqued and then I used free motion to quilt the top. 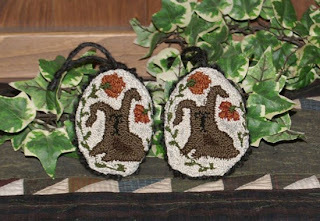 The background pieces are done with meandering stitches and free form designs, and the border was done in a vine with leaves pattern. I found a great way to draw designs onto your quilt before quilting. This is great for those of you who like to do their own designs and have a guide as you stitch. It is called a chaco liner pen by Clover. It is a chalk pen that comes out as you move the tiny wheel across the fabric. It is refillable and affordable, my new best friend for quilting. I love how Dora's face came out. I use free motion quilting and draw the faces on with the thread. I even made a few little designs while I was doing the meandering. 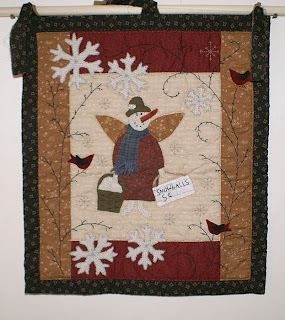 You can't see it, but there is a duck and a mouse hidden in the quilt;) When I get a chance, I will add tabs and hang it from a stick that I found and hang it over my entryway. Today I worked on my cat wall hanging. I finally got the top stitching done and the binding. 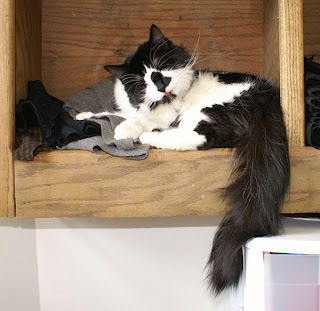 Now it is in the dryer, so tomorrow I will show you how it came out. I usually shut the door to my sewing room, but I forgot this time and guess who came to help out, while I wasn't looking. While I was working on adding a border design, Dora was busy trying to figure out how scissors work. I cannot leave anything around with her, she plays, and chews on anything she can get her paws on. Today I finished my Snow Lady. I got the original pattern from Twigs and Sprigs and it grew from there. She has wonderful patterns for all types of mediums and you can get instant patterns as well as freebies. I want to do her angel and lambs for the spring. 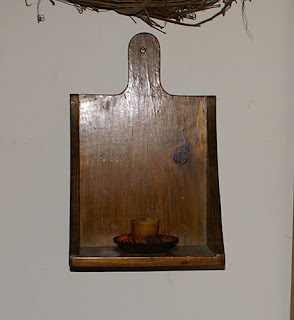 I think it will be fun to do seasonal hangings that I can change out. I made tabs by hand sewing on strips of the border color, to the backing. Since the quilt is washed and stiffer, I just used 3 tabs. I like the primitive looks of tabs and they are quick and easy. Plus, I can always take them off if I want to redo it another way. I plan on hanging it from stick I have been saving, now if I can just remember where I put it:) So, for now I just threw it up on a dowel without tying properly, to get a shot. I really need to get a tripod, I shake too much. 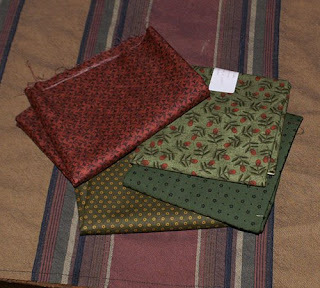 I also used a new product for me, June tailor's fusible batting. It really was so much easier than pinning and it is nice and stiff and took well to a washing. For some reason the other package is different, even though it is the same product, need to check into that. 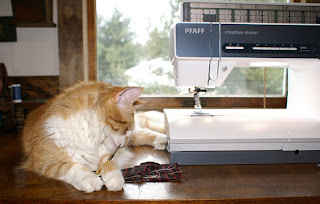 I like the stiff one, great for machine sewing, but tough for the hand quilting. I am usually not that lucky, but today I received another wonderful prize from a recent blogging contest. Tak, Quilt in Me, recently held a contest and decided to have two winners. Well, I was the lucky second winner and I feel like I won the grand prize. I was overwhelmed with her generosity. 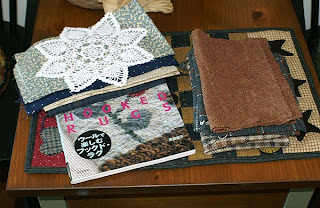 And if that was not enough, she sent me luscious fabrics and wool and a beautiful doily. 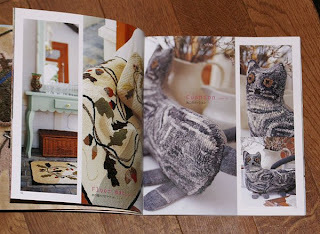 And to top it off, a Japanese rug hooking book. Tonight I made one of my favorite meals and thought I would share it with you. I have food allergies, so if you are on a yeast free diet, this bread is perfect for you. 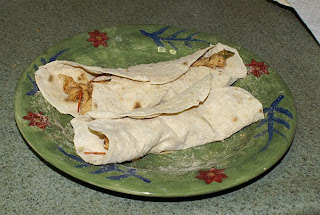 It is so simple and perfect to wrap around your favorite fillings. Add 2 cups of white flour, 1/2 tsp baking powder, 1 cup warm water and 1/8 cup oil. Flours can be different, so if it is too moist, add a bit more flour. You want the dough to be soft and more moist than dry, but not a wet moist. Make your balls, about 2" round. I roll my dough in whole wheat flour, it gives the bread a nutty taste, but you can use white flour. 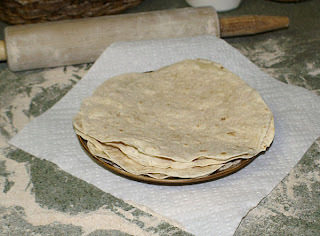 Roll the dough out and move around to make it as round as possible. Roll it till it is paper thin, or you can make it a little thicker, you can experiment to see what you like best. Heat a skillet, I use setting 5 on my gas stove, about 1 above a medium setting. Throw you rolled bread into the pan and when bubbles form on the top, turn it over. It cooks quick and you want it slightly browned, but soft. I make these up and fill them with a mix of chicken, onions, various peppers, including hot and sometimes tomatoes. You can also use them for tuna or any sandwich filling that you like. I refrigerate the extras and the next day, I heat them up for a few secs in a pan and they are like you just made them. One of my favorite pastimes is to go thrift shopping, you never know what you will find. 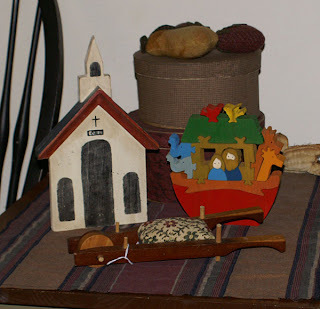 We have a few thrift stores along with antique consignments, so there are plenty of places to look for treasures. Sometimes I buy things just because it is neat, or interesting or something I can remake into a new item. Since I was out and about and the Folk art quilt store was in the area, I just had to stop by and see what new items they might have. Nothing new, but I picked up some nice greens and a beautiful red shade. 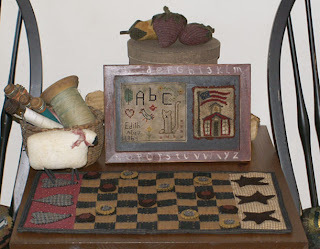 I love to make hearts on some of my quilting items and it is hard to find nice prim reds. I am always in need of good greens for leaves and stems. It seems the stores never have the shades I am looking for, so I have to settle. I guess I will have to start ordering online.